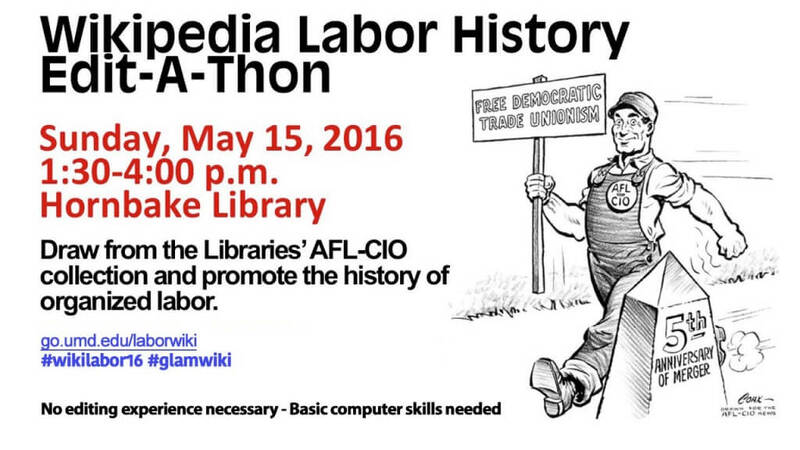 Join a community interested in promoting labor history by editing the popular online encyclopedia Wikipedia. Part celebration and part workshop, Edit-a-Thons are organized around a single topic as a means to build awareness and community. We’ll draw content from labor-related collections at the University of Maryland, including the AFL-CIO Archives. No editing experience necessary, however participants should have basic computer skills. All participants will receive complimentary issues of Labor’s Heritage journal. If you will not be able to attend in person, never fear, you can still contribute valuable editing! Just visit the Wikipedia event page (go.umd.edu/laborwiki) for more details. Help us make Wikipedia as accurate as possible on labor history topics and issues.